Indigo High Waist Shaper Jeggings is rated 4.4 out of 5 by 82. The ultimate curve control jegging, in a super comfortable and super-stretch denim fabric, that fits your shape perfectly. In a new rich indigo colour. Stylish elastic inserts along the high waist band add a chic and slightly sporty look. #YourNewFavouriteJeans. 70% Cotton, 26% Polyester, 4% Elastane. Rated 3 out of 5 by Lisa from Difficult to pull on I love the look and feel of theses once on and very flattering. But they are not the easiest pants to pull up. On saying this a zip would spoil the look. Rated 4 out of 5 by Ss444 from They're ok I got these in the blue colour and black, same size but the black fit so much better than the blue, they're really tight on the waist compared to the black which is a shame. Rated 5 out of 5 by Ljjt93 from So comfortable! I love high waisted jeans I find them so comfortable to wear! I brought these incase I had a disappointment with another pair of jeans I'd brought off this website. I had brought a size 14s as I'd realised with another pair of stretch jeans, that a size 12s may have been too small. The 14s, on me, are a little bit too big on my waist and probably would have benefitted from buying a 12s. However, they fit brilliantly everywhere else and perhaps a 12s may have been too small everywhere else! Although these jeggings are a little bit too big they aren't un-usable and they're fine for travelling to and from work in. They're also quite nice to wear on bloaty days when I want to wear jeans but feel comfortable at the same time. Rated 2 out of 5 by Trayhutch from Disappointed I bought these for a weekend away, unfortunately couldn't wear them. Im used to wearing regular length jeans as 'ankle grazers' as im 5ft 10, but looking at the fit model, these shouldn't have been 'pedal pushers'. Such a shame as the material and fit made my bum and thighs look great. The 3/4 length ruined this effect though. Rated 2 out of 5 by Aimee from Too small I have the normal high waisted shaper jeggings in a size 14 and they are perfect. The coating on these make them to small with no give at all l. Also I'm 5 ft 10 with 32 inside leg and they don't do a tall version but these are just to short. Very disappointed as I've never had a problem with simply be jeans or jeggings before. Rated 1 out of 5 by Mamamayhem from Wouldn't fit a small child!!! Ordered a size 12. These wouldn't even fit a small child the waist is so small. Push all your fat upwards so it all hangs over the top. Defo not for me! Order a size bigger than you need and prepare not to breathe for the day!!! Rated 4 out of 5 by Vicsta from Finally! leather look jeggings that fit! Ive recently purchased the coated jeggings,i have all the colours now and styles now! I normally need to go down a size in the high waisted jeggings which I love,but with these I would say stick to you're normal size! They fit nice and skinny so no saggy areas! Very flattering and comfy! 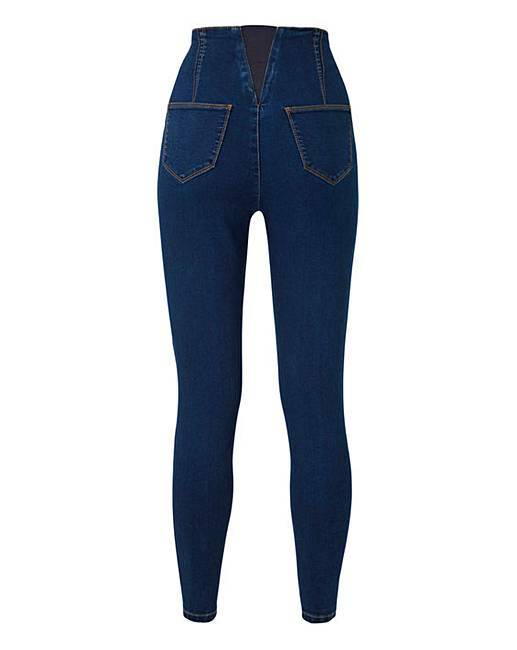 Only flaw is that you can't buy the coated jeggings in a shorter size which would of made them 5 stars! Rated 3 out of 5 by Kjfox44 from Nice but small! Look lovely but after unwrapping them i thought id recieved the size intended for a size 10! Least order size bigger n hope u dont need the loo while on a night out!